The National Institute of Justice has launched an interactive website dedicated to exploring the CSI Effect theory and the myths and facts surrounding forensic evidence presentation in the courtroom. The website is targeted to officers of the court and provides the latest research on the CSI Effect theory as well as observations from trusted experts throughout the justice community. It can be accessed by clicking here. The CSI Effect Theory was developed for NIJ by the National Forensic Science Technology Center (NFSTC), award # 2008-IJ-CX-K405. From SCOTUSBlog's Lyle Denniston: "New curb on crime lab reports Once more divided 5-4 on how to define the right of a criminal suspect to confront accusers, the Court rules that, if a crime lab report is offered by prosecutors, the person who did the test and prepared the report must testify, and a supervisor cannot do so in the absence of that technician. A closely divided Supreme Court on Thursday continued its pattern of restricting prosecutors’ use of out-of-court statements to get criminal convictions, ruling that a report of a crime lab is valid evidence only if the technician who did the testing or observed it — not a substitute witness — is called to the stand. But the main opinion, and a concurring opinion, labored at length to stress just how little the Court had decided. It was clear that the Justices who controlled the outcome had been put on the defensive by an aggressive dissent — typical in this line of cases. The case of Bullcoming v. New Mexico (09-10876) was a test of whether a five-vote majority would remain to protect the constitutional legacy of the Court’s seven-year-old ruling that for the first time demanded that live witnesses be summoned to court in a criminal trial, to face cross-examination for statements made outside of court that could help persuade a jury to convict. That basic ruling came in Crawford v. Washington. Since the most recent sequel, the 5-4 decision in Melendez-Diaz v. Massachusetts, in 2009, two Justices from the majority then have retired, so Bullcoming was the first chance to see whether their replacements would be part of a majority adhering to the Crawford doctrine. The result was somewhat uncertain. Justice Sonia Sotomayor, who replaced Justice David H. Souter, supported the outcome and joined most of the main opinion but also wrote on her own to put special emphasis on “the limited reach” of the main opinion (written by Justice Ruth Bader Ginsburg). And Justice Elena Kagan, who replaced Justice John Paul Stevens, joined most of the Ginsburg opinion, but not support the concluding section that suggested ways for prosecutors to get crime lab reports before juries, and also did not join Sotomayor’s recital of what was not decided — a recital that also might be a road map for prosecutors from here on. Without counting the numbers, it appeared that what might be called the current “Crawford majority” was a bit shaky. That could not be said, though, of the dissenters. Those four, using the same kind of strong rhetoric they did when Melendez-Diaz went against their views two years ago, protested with renewed vehemence about the majority’s barring of “reliable” evidence of crime because of their devotion to a “wooden formalism” in applying the Constitution’s Confrontation Clause. This renewed battle over the Sixth Amendment right of an accused person to confront, face-to-face, those who were his accusers, came in the most routine kind of criminal case: drunk driving. By the 5-4 vote, the Court overturned a decision of the New Mexico Supreme Court. That court had upheld the conviction of Donald Bullcoming of Farmington, N.M., on charges of aggravated drunk driving. Bullcoming was sentenced to two years in prison. The majority on Thursday ruled that Bullcoming’s confrontation right had been violated because prosecutors were allowed to offer a crime lab report analyzing Bullcoming’s blood sample, and had called to the witness stand not the lab analyst who did the tests, but a supervisor at the lab who had neither done the test nor observed it being done. Producing such a substitute, or “surrogate,” witness, the Court ruled, is not sufficient to satisfy the Sixth Amendment confrontation right. This, the Court said, logically followed from the Melendez-Diaz ruling, which had ruled that a crime lab report could not be introduced without some live testimony from an analyst to defend it and to be cross-examined about it. In the crime lab sequel case of Bullcoming, the Court decided, in the words of Justice Ginsburg as she announced the decision orally, “we decide who that live witness must be.” The only person who could fill the role on the stand, she wrote, is an expert who actually did the testing and prepared the lab report the prosecution wants to offer, or a person who closely observed the testing that led to the report. Even if the lab report is otherwise entirely reliable, Ginsburg wrote, only a technician closely involved in its preparation can be the one to defend it and face defense lawyers’ challenging questions. Using a surrogate, such as an uninvolved lab supervisor in Bullcoming’s case, the Court said, “could not convey what [the technician who did the test] knew or observed about the events” in the lab as the testing was done and a report prepared. And, it added, a surrogate could not “expose any lapses or lies” on the part of the analyst who did the tests and signed the resulting report. Those declarations had the support of Justices Kagan, Sotomayor, Antonin Scalia and Clarence Thomas (although Thomas refused to support a footnote that suggested that some “business and public records” could be admitted as evidence even without confrontation, because of the benign purpose for which they were offered. Justice Sotomayor made further clear in her separate opinion that the lab report used against Bullcoming should not have been admitted. Kagan, Thomas and Sotomayor did not support what was labeled Part IV of the Ginsburg opinion, which had the support only of Scalia. In that section, Ginsburg contended that the ruling would not “impose an undue burden” on prosecutors. She then discussed several ways by which “forensic evidence” — that is, crime lab reports — could be offered at trial. She suggested that states could require labs to preserve the evidence so that it can be retested and then call to the stand the technician who did the new analysis if the technician who did the first report is not available, or pass a law that would require prosecutors to give defense lawyers advance notice of a plan to use a lab report and take away the defense’s confrontation right if they failed to demand that the preparer appear. In that section, Ginsburg also sought to marshal statistics — different from those used by the defense to make an opposite point — that past Crawford rulings have not caused the sky to fall. Justice Sotomayor’s concurring opinion also sought to answer the dissent’s anxious worries over impact, suggesting that a lab report might come into evidence on its own if it had not been prepared with the purpose of creating evidence of a crime, a lab supervisor might be allowed to come in to defend a report if he or she had a personal connection to the test at issue — such as observing the technician who did the testing, expert witnesses might be used to give their independent opinion about a lab report if the report itself is not admitted, or “raw data generated by a machine,” with no other subjective analysis of its contents, might be admissible along with the testimony of an expert witness on such a machine. Justice Anthony M. Kennedy’s strongly worded dissent was joined by Chief Justice John G. Roberts, Jr., and by Justices Samuel A. Alito, Jr., and Stephen G. Breyer. Much of the dissenting opinion amounted to an argument favoring admissions of reliable documents as evidence in criminal trials. A good deal of the rhetoric, though, was merely a continuing complaint about the entire line of cases beginning with Crawford, and a renewal of complaints about how those rulings are disrupting the way crime labs operate and criminal trials are conducted." "... Search by Image returns the best results for images that have related content already on the web, so you’re more likely to get relevant results for distinctive landmarks or paintings than you will for more unique photos like your toddler’s latest finger painting. In addition to getting relevant results about your image, you can also find visually similar images or the same image in different sizes or resolutions. Search by Image starts with the computer vision technology underlying Google Goggles, and adds new techniques and functionality that optimize the experience for desktop. The technology behind Search by Image analyzes your image to find its most distinctive points, lines and textures and creates a mathematical model. We match that model against billions of images in our index, and page analysis helps us derive a best guess text description of your image. Search by Image technology also includes the ability to match against images on the web so that we can show you similar images and webpages that contain your image ..."
Click here to read the whole article. Needless to say, this could add tremendous value to your investigations. "...Legal soothsaying is folly, but Briscoe’s facts and remand still have something to tell us. While another “test” case will undoubtedly arise to offer the Supreme Court a chance to elaborate on Confrontation Clause requirements, Melendez seems in no imminent danger of being overturned or seriously modified. In the meantime, state and lower federal courts will look to the “notice and demand” statutes, suggested in Melendez (Georgia, Ohio, and Texas), as models for their own statutes. Thus, forensic scientists will continue to be ordered to testify as to the procedure and accuracy of the results in their reports. They will also be cross-examined. While this role is not new for many forensic scientists, this role is likely to affect more forensic scientists and will require additional training just as it surely will result in a loss of lab time. Articulating and explaining lab analyses procedures and the scientific choices attending test conclusions requires different skills than making the analysis itself. Finally, an intriguing and related question is: which scientist will testify to what? As we have seen, some state laboratories have several scientists working on the same sample. Other labs have turnover rates such that some scientists will be employed elsewhere when a sample upon which they worked is admitted at trial. That singular issue requires its own article to address. The Briscoe case raised more issue than answers. But even these issues, and the accompanying Briefs, sharpened the kinds and quality of answers the next Melendez application the Supreme Court will be asked to address ..."
"... The scientific capabilities of the latest versions of Adobe Photoshop are considered by many forensic photographers to be the gold standard of post-production image control. Photoshop is often used to split out individual R, G, B color channels for image analysis, and many advanced users cite the mechanics of the workflow and multiplicity of possibilities as advantages of this huge and complex system. However, there are other filter emulation and software effect systems that are more intuitive and may even offer useful capabilities that are less cumbersome than Photoshop. A good example is Tiffen Dfx, which provides 113 different filter selections in the Version 2 Standalone and is available as a plug-in for Photoshop or Aperture 2.1. In its Image Tools & Effects, Dfx provides an EZ Mask tool that lets you easily isolate any specific area of the subject to which you want to apply effects, plus a Color Correction tool that allows you to separately adjust hue, saturation, and brightness, shadows, mid tones, and highlights, as well as gamma, red, green, and blue. You can also apply a black-and-white filter, select filter options, and then dial in the appropriate color channel until the details you want to accentuate are clearly visible. Can you do these things in Photoshop? Yes, but for most users it’s easier and faster in Dfx because it provides an intuitive user interface plus filter parameters that closely match traditional optical filters. Indeed, many CSI units are currently using this software ..."
Although interlaced video is slowly going away, analysts still see this type of evidence in their labs. The tools available for de-interlacing video can be hard to use, and even harder to explain in simple terms. Typically, when a video is de-interlaced, the upper and lower lines are segregated and two separate files are created. The lower and upper fields correspond to separate camera views - but you're left with a choice - leave the files as is (shallow rectangle shaped half resolution) or interpolate so that the video looks "normal" (full resolution). Photoshop's De-Interlace command can be problematic. With Photoshop - it's an either/or proposition. 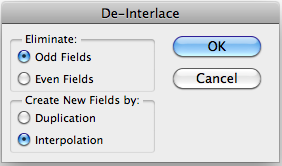 Get rid of the even fields or the odd fields - then create new fields using either duplication or interpolation. ... what did you just say? .... Eliminate? Create? Ouch. With Amped Five, it's a little different process. 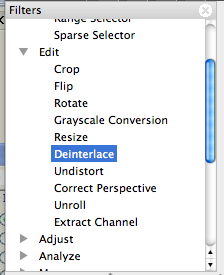 Once your video is loaded, you select Deinterlace from the Edit menu. This brings up the following dialog box. "Cubic" interpolates by taking into account more distant lines too. In general, Cubic is the best choice, even though there is not much difference with the linear interpolation. But ... now we have got all the frames of the sequence, shuffled together (as hinted at above). Often, in CCTV, subsequent frames are related to different cameras and consequently, we have many different sequences blended together. How can we separate the frames of the sequence of interest from the other ones? All we have to do is to use a selector filter, to be chosen from the category "Select Frames". "Sparse selector" selects sparse frames in sequence. Since the frames we need are scattered throughout the video, we need the flexibility of the "Sparse selector". We add it to the chain, then find out the initial position, and go through every frame of the video. When you encounter a frame that belongs to the sequence you need, just "Add Current" to the list. Once done, apply: you will get a short sequence, made of all the selected frames. Going frame by frame is a pain. I'm told by the developer that the next release will tackle this problem in a more automatic fashion. Governments are at a philosophical cross-roads. The cynical politician withholds those services that taxpayers expect; police and fire, road maintenance, and basic administration whilst lavishing upon the preferred. The city's leaders are facing tough and unpopular choices - return government to core functions and stop the free ride ... or ... Most are just performing accounting tricks and kicking the can down the road. The problems get worse. More reaction. Then worse again. The man who handed me an application to join police service over a decade ago had a dream of assembling the very best he could find, the Aptissimi, and enabling them to dream big, to dare, to challenge convention, and to succeed in building an amazing enterprise. He knew, as others like Henry Ford have known, that you don't have to know everything or be the best yourself. He wanted to surround himself with those kinds of people - the Aptissimi. Bring them together, enable them with the best tools, and get out of the way so that they could succeed. Their success became the enterprise's success - and the City's success. Many around the country attempted the same experiment. Together, in groups like LEVA, NATIA, the IAI, and the SWGs, we dreamed and dared and came up with some amazingly innovative solutions to very complex problems. Refusing no one of talent, privateers joined the cause. At the very time in history where the National Academy is demanding scientific standards and practices, and Senator Leahy attempts to put teeth to their recommendations, governments big and small are allowing expediency to dictate, for good or ill - mostly ill. Budgets are being cut. Aptissimi are being let go, or repurposed to other less suitable tasks. The politician says to the Aptissimi, your services are no longer needed. Yet the courts demand that standards be maintained. Winston Churchill said, "a pessimist sees the difficulty in every opportunity; an optimist sees the opportunity in every difficulty." It is my hope that the Aptissimi remain optimistic and engaged. The work still needs to be done. Who will assist the Trier of Fact? Those with the training and experience to know the difference between truth and fact, the difference between what you know in your heart to be true and what you can prove. Proof requires facts. Proof requires valid processes. Validity and expediency don't always play well together. So chin up. Soldier on. Let's help each other get through this rough patch. If you need me, I'll be here. I think we've untangled all the mess from getting hacked. Posts to resume soon. Sorry for the delay. One of the more popular requests in Law Enforcement is to blur or obscure undercover officers or cooperating witnesses (entirely or just their faces) from surveillance video. Adobe's Colin Smith provides a video tutorial on Adobe TV that shows how to obscure a face using the Mosaic effect and the Track Matte Key effect in Adobe Premiere Pro. He also shows a rough and manual way to do this in After Effects in this video. For a more automated and precise way to accomplish this in After Effects, see this video. What's new and changed in Premiere Pro CS5.5? Here's a nice summary of what's new and changed in Adobe's Premiere Pro CS5.5. With the many agencies using Media Composer as their primary platform looking to transition to Adobe's product line, confusion is mounting as to how to get the two to play nicely together. Here's a simple procedure from Adobe for getting your Media Composer sequences into Premiere Pro CS5. 1. In Media Composer, select a sequence and click File > Export. 2. In the Export dialog box, select AAF and select “Link to (Don’t Export) Media”. 3. Name your exported sequence, browse to a location to save it, and then click Export. 4. In Adobe Premiere Pro, open a new project from the Welcome screen by clicking the New Project button, or choose File> New> Project (on a Mac, Option+Command+N or Cntrl+Alt+N on a PC). Click OK.
5. The new Sequence Dialog Box will appear. Continue without creating a new sequence. 6. Double click on the empty project pane of the new Adobe Premiere Pro project, which will open up the Import dialog box. 8. A dialog box will open requesting the location of the media files. Navigate to the Avid MediaFiles folder and find the first of the missing files. Adobe Premiere Pro will recognize the other missing files in that location and import them automatically. Your media will be imported into the project with the same media names that you had in Media Composer. Your sequence will also be imported and you can double click it in the Project pane to open it into the timeline. If Adobe Premiere Pro and Media Composer are running on the same system, all media should link up automatically. If, however, you are moving from one computer to another, Adobe Premiere Pro will prompt you for the location of the source media. If moving from a Mac to a PC, be aware that certain QuickTime codecs have not been released for the PC, and the source media in those formats will not play on the PC. This includes, for example, QuickTime files that use ProRes. If you experience problems with QuickTime media in Adobe Premiere Pro, check to see if the source media will play correctly in QuickTime Player on the PC first before troubleshooting in Adobe Premiere Pro. I'll be one of the featured speakers and workshop presenters at August's DSI-Vegas. You're used to me presenting and working with Photoshop. This time, I'll be showcasing Premiere Pro. In the workshop, you'll get a hands-on look at the many features of Adobe's Premiere Pro as you move from import/capture, to processing, to export. This workshop will offer practical techniques that are specific to law enforcement's unique requirements. Topics covered: getting the most from your hardware, platform issues, saving still images for Photoshop, speed changes, fields/frames, resizing, and much more. I'll be putting up more posts related to Adobe Premiere Pro ahead of my appearance at August's DSI-Vegas. Here's the first shot - some free stuff from Adobe.